Molecularly imprinted polymers (MIPs) were prepared using bisphenol A (BPA) as a template by precipitation polymerization. 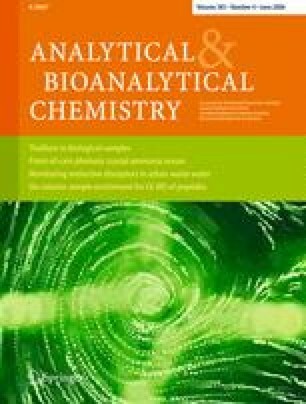 The polymer that had the highest binding selectivity and ability was used as solid-phase extraction (SPE) sorbents for direct extraction of BPA from different biological and environmental samples (human serum, pig urine, tap water and shrimp). The extraction protocol was optimized and the optimum conditions were as follows: conditioning with 5 mL methanol–acetic acid (3:1), 5 mL methanol, 5 mL acetonitrile and 5 mL water, respectively, loading with 5 mL aqueous samples, washing with 1 mL acetonitrile, and eluting with 3 mL methanol. MIPs can selectively recognize, effectively trap and preconcentrate BPA over a concentration range of 2–20 μM. Recoveries ranged from 94.03 to 105.3 %, with a relative standard deviation lower than 7.9 %. Under the optimal condition, molecularly imprinted SPE recoveries of spiked human serum, pig urine, tap water and shrimp were 65.80, 82.32, 76.00 and 75.97 %, respectively, when aqueous samples were applied directly. Compared with C18 SPE, a better baseline, better high-performance liquid chromatography separation efficiency and higher recoveries were achieved after molecularly imprinted SPE. This work was supported by the National Natural Science Foundation of China (grant nos. 30200061 and 20477013).